The first Pioneer flew in 1968. The design features a fixed monowheel landing gear, wings of wood and fabric, and a fuselage of fiberglass. The wingspan measured 42.64 feet to allow the wings to be built in a standard 20-foot deep garage. 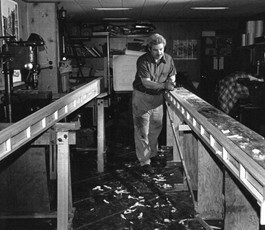 Bernie Gross working on his aircraft The roll control utilized conventional ailerons, with upper wing surface spoilers paired with a similar set of devices on the wing lower surface for glide path control. Because the airplane is tailless the center of gravity range is very narrow. To simplify weight and balance considerations the monowheel landing gear is located on the desired center of gravity and the pilot’s seat is adjustable fore-and-aft. Before takeoff, the pilot moves the seat until the aircraft balances on the wheel to ensure that the balance is within the center-of-gravity range. Starting in 1972 the Pioneer II was made available as plans or as a kit. 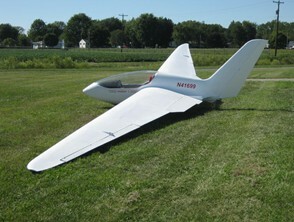 The kit included a pre-made fiberglass fuselage shell. The glider is stall resistant and completely spin-proof. It could be built from a kit in about 600 work hours. Empty Weight 380 pounds Payload 250 pounds Gross Weight 630 pounds Single Seat 15 were built. There were seven Pioneer II’s registered in the USA in 2011 and four in Canada. 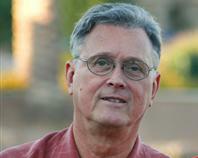 Editor note: Bernard Gross, who was deaf from birth, first flew the Pioneer, which he called the “Deaf Hawk,” in 1985.